Planning your wedding, as exciting as it is, may cost you a lot of time, efforts, and… money. Now matter how hard you try, you will inevitably struggle to fit in your budget, compromising one thing or another. That’s something completely normal and you should not feel bad about it. There are, however, some tricks that you can use that will both help you feel more comfortable when it comes to your wedding venue and save you some money (that you can spend on a more expensive wedding dress, for example). Getting married in a public park may be your dream come true! Depending on where you live, you can choose from many diverse public parks (or other public open spaces) that offer beautiful views and a festive atmosphere. Make a city tour with the future husband and note the sweetest spots in your area. Then discuss the options with your photographer and decide on the one that best suits you and your vision for a perfect wedding. Have you considered your home (or the home of a friend/family member) as a wedding venue? Choosing this option for your wedding venue may sound a bit strange at first, but it is totally worth considering. If your house has a backyard with potential (nice setting, different possibilities for decorations, etc), include it in the list. Do you have a friend whose garden has great views? Ask them if they would mind you getting married there! Choosing a friend’s/family’s house as a wedding venue adds a personal touch to your wedding that will be a pleasant surprise to your wedding guests. Yes, this one is a bit eccentric, but it’s definitely a unique idea that no one of your friends has thought about! If you have decided on an outdoor wedding, think about having a picnic. There are several pluses to this fun, yet classy idea. 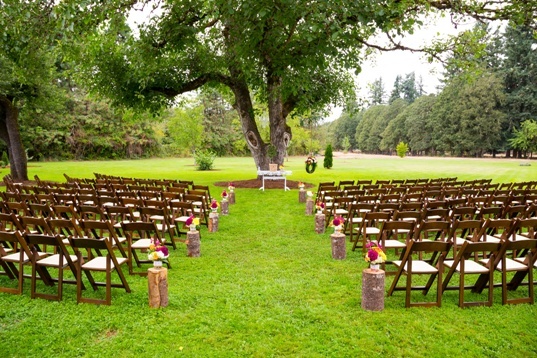 First, you won’t have to pay for the venue as you will use a park or a public picnic lawn. Second, you won’t have to pay for tables, chairs, waitresses, table decoration, etc. Just throw a blanket, add a nicely decorated picnic basket with delicious food and wine and you’re all set! • Saturday is the most common day used for weddings; hence it’s the most expensive one. Some venues will charge up to 50% less if you book their location for a Sunday or Friday instead! • Summer is the season of weddings – it’s sunny, the weather is nice, and… it’s the most expensive season to marry in! Consider an off-season month instead (November or January), to cut your costs. • Evening weddings are up to 30% more costly than morning weddings – why not get married in the morning? You will both save some money and spend more time as a bride!